Thousands of Pacific walruses have again gathered on the northwest shore of Alaska as the Chukchi Sea approaches its annual sea ice minimum. Residents of the Inupiaq village of Point Lay on Aug. 22 reported hearing walruses, said Andrea Medeiros, spokeswoman in Alaska for the U.S. Fish and Wildlife Service. Spotters taking part in an annual aerial marine mammal survey on Aug. 30 photographed walruses on a barrier island near Point Lay. An estimated 25,000 animals were there, Medeiros said. "The herd is 2 to 3 miles (3 to 5 kilometers) north of the old village site on the island," Medeiros said. "We are monitoring the herd with the help of local people and U.S. Geological Survey staff who are on site doing research." Walruses over the last decade have come to shore on the Alaska and Russia sides of the Chukchi Sea as sea ice diminishes because of global warming. 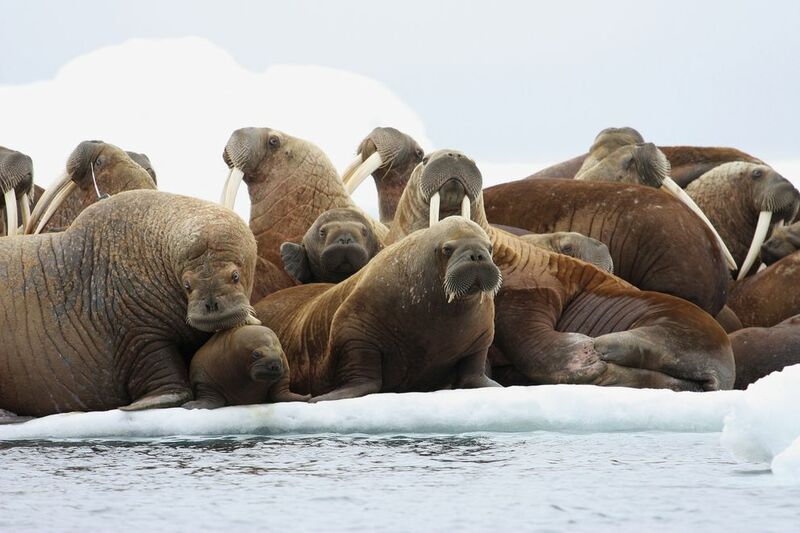 Walruses use sea ice to rest as they dive to the ocean floor to hunt for clams and snails. When ice recedes north of the shallow continental shelf, walruses head to beaches to rest. The animals lie shoulder to shoulder and can be startled by a polar bear, airplane or hunter. Young animals, especially calves born earlier in the year, are vulnerable to being crushed in stampedes if the herd suddenly seeks refuge in the ocean. The USFWS tries to prevent stampedes by notifying pilots and boat operators to stay away from herds. James MacCracken, a USFWS supervisory biologist, said in response to questions that about 20 carcasses from animals this year have been seen on the beach along with 30 carcasses from last year. 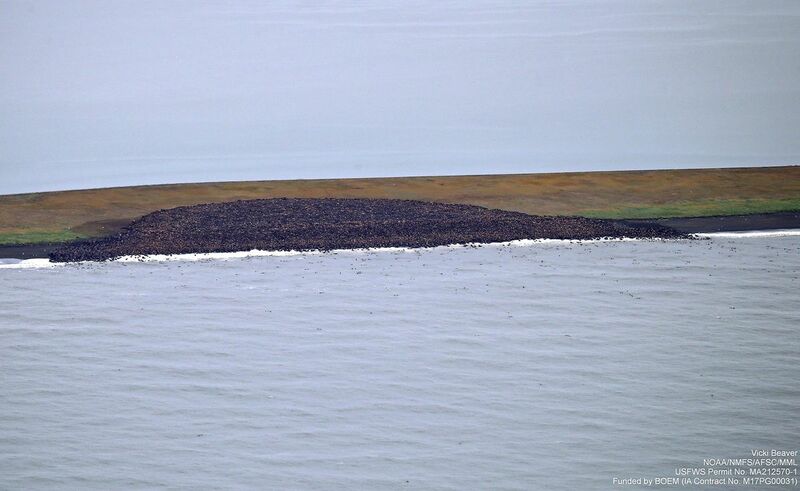 The agency expects to monitor walruses at the site until the animals leave, MacCracken said. The agency has received no reports of walruses gathered elsewhere on the Alaska coast or on the Russian side. Russian officials are monitoring four sites in Chukotka, he said, but have no internet access. Walruses spend winters along the edge of ice in the Bering Sea. Mature male walruses remain in the Bering Sea all year and forage from shore. In spring, adult females, young calves and many juvenile walruses migrate north all the way through the Bering Strait to feeding areas in the Chukchi Sea, often staying near the ice edge or pack ice as it recedes north. Sea ice usually melts to its summer minimum sometime in September. The date varies widely, said Agnieszka Gautier of the National Snow and Ice Data Center at the University of Colorado. "NSIDC does not have a precise date at this point," Gautier said by email. "The minimum has gone as late as Sept. 21, in previous years." Walruses were spotted by participants in the Aerial Surveys of Arctic Marine Mammals, an interagency program that documents the distribution and abundance of bowhead, gray, right, fin and beluga whales and other marine mammals.